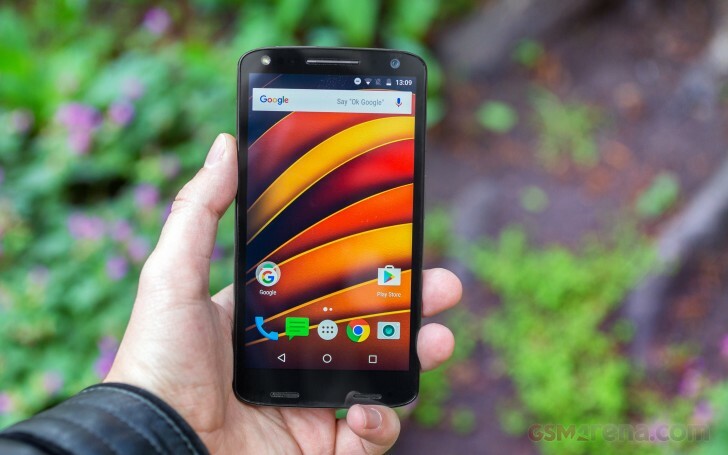 Motorola Moto X Force may come with Android 5.1.1 Lollipop pre-installed out of the box, but a firmware update to Android 6.0.1 Marshmallow is already seeding worldwide. The Moto phones have been famous for the Nexus-like features - free of bloatware Android OS with the original skin, and on-time firmware upgrades for at least 2 years. The lack of any customizations is the sole reason for the fast updates. Still, there are some proprietary features offered on the phone - all found within the Moto app. One of those features is Moto Display. It shows notifications on a black lockscreen, which you can handle with swipes in different directions. You can't control the content that shows there. There's no "hide sensitive content" option either. You can, however, block entire apps from posting notifications. The Moto Display isn't an Always-On display like the ones on the Galaxy S7 or LG G5. It can be configured to light up upon hand reach or once you get it out of your pocket. There is a shortcut for unlocking the screen if needed. The lockscreen itself is very familiar - a clock, notifications and a couple of shortcuts (voice assistant and camera, instead of the usual phone and camera). Swiping down shows the quick toggles and the brightness slider. The camera, however, can be also triggered by double pressing the power button while the phone is asleep. The one thing we wish stock Android would bring from the skinned implementations is the Auto brightness toggle. You would have to dig in the settings menu for that as the toggle is not available on the quick toggle dropdown. Other than that, you can pick the large-size toggles, the ones you'll use most often (Wi-Fi and Bluetooth by default). Long-pressing a toggle or hitting its down arrow brings out additional details, e.g. Wi-Fi settings and detected Wi-Fi networks respectively. The Moto X Force doesn't have a fingerprint scanner, so you'll have to rely on a PIN or a password. Luckily, Google has developed a number of ways to reduce the hassle of unlocking the device. Secure locks can be disabled in trusted situations. This can be anything from a trusted place, through a trusted device (e.g. your smartwatch) to three biometric options: your face (susceptible to doppelgangers), your voice and even your body (unlock the device once and it stays unlocked while it's on your person). There is not much going on the homescreen - the Moto X Force has one of the leanest app packages we've seen. At first, it has just a single homescreen pane and most of it is empty. Even the list of all apps fits on one screen. Even so, there's not as much free space as you would imagine. We have the 32GB version, the other option being 64GB, and there's only 19GB of storage left over for the user partition. About 3GB of that is taken up by the installed default applications (such as Play Store, Gmail, Maps, Play Services, among others). This leaves us to believe the core Android OS is taking some good 8GB of storage, which is quite surprising. Multitasking is done through the app switcher, a 3D rolodex menu. You can swipe apps to dismiss them. You can also check how much RAM was used by any app in the last few hours so memory hogs are immediately visible. Multiple users are supported, you get an Owner and a Guest account to start you off. You can add more users, each with their own apps, their own wallpaper and so on. Some settings (like Wi-Fi or app updates) affect all accounts. Native app permissions finally landed on Android. Each app - even the pre-installed ones - will ask permission before accessing your data. Once you hit "Allow", they won't ask again (you can revoke the permission from the settings). To save you from spammy apps, the Deny option comes with a handy checkbox to make the denial permanent. Finally, the Moto app, in addition to the Moto Display options, offers a bunch of other goodies. You can enable various motion gestures, which trigger different actions - shake twice for torch, keep the screen on while you are looking at it, wrist twist for quick camera capture, and lift the phone up to engage the Moto Voice. Moto Voice is the actual personal assistant and perhaps the coolest part about it is that you can setup a custom launch phrase like "Yo, dawg!" instead of being limited to just "Hey, Moto X!". It can do lots of important stuff such as calling, texting, checking things out for you, post to Facebook, among others. Indeed, the stock Android is perfectly smooth, and the fast octa-core processor with 3GB RAM is surely helped by the Marshmallow optimizations.